China's famed Shaolin Temple is renowned for its association with Chinese martial arts and particularly with Shaolin Kung Fu, the study of which involves a deep immersion in the principles of Zen Buddhism. 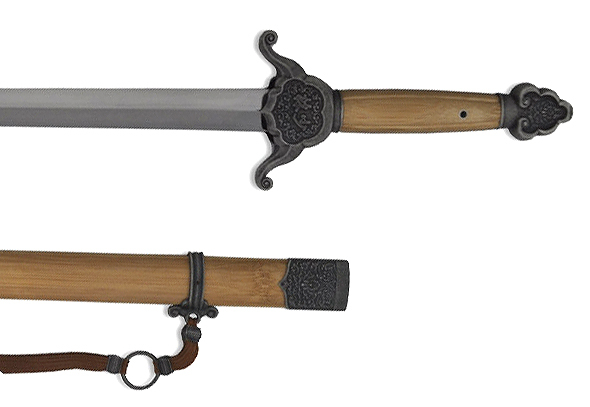 This jian has been created with the express authorization of the Shaolin Temple. The blade is forged in high-carbon steel, carefully heat treated to a spring temper and polished. The highly detailed fittings feature lotus flower decorations and the Shaolin Temple emblem in antiqued stainless steel. The hilt and scabbard are in rosewood. Also available with brass fittings.